Please give 24 hours notice if you wish to cancel an appointment. Missed or late cancellations may incur charges. 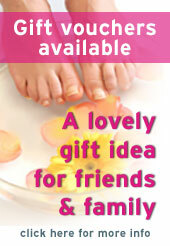 Do you know someone who would benefit from reflexology? Give them a gift voucher whether it is for birthdays, Christmas or just as a thank you – to let them see how beneficial this wonderful treatment is. Order a gift voucher using the enquiry form.